Amidst their biggest UK voyage to date, The Big Moon landed in Liverpool on Friday with support from Get Inuit and The Mysterines. After slots with The Sundowners, The Coral and an appearance at Skeleton Coast Festival earlier this summer, it’s no secret that The Mysterines are making seismic sounds across Merseyside, leading to an impressive early turn out for their performance. As soon as the chorus hit on the first song, we bore witness to Lia Metcalfe’s roaring vocals. The Wirral Trio’s set slowed down a notch for love song Sticky, but instant earworm Bet Your Pretty Face upped the tempo once again. Alongside Lia’s powerful vocals, bassist George Favager and drummer Chrissy Moore put every last ounce of energy into their performance making for a force to be reckoned with. The nostalgic woo’s of Robbie Williams’ Millennium rang through the venue, suitable intro music for a band who capture the spirit and sound of the millennial generation so well. 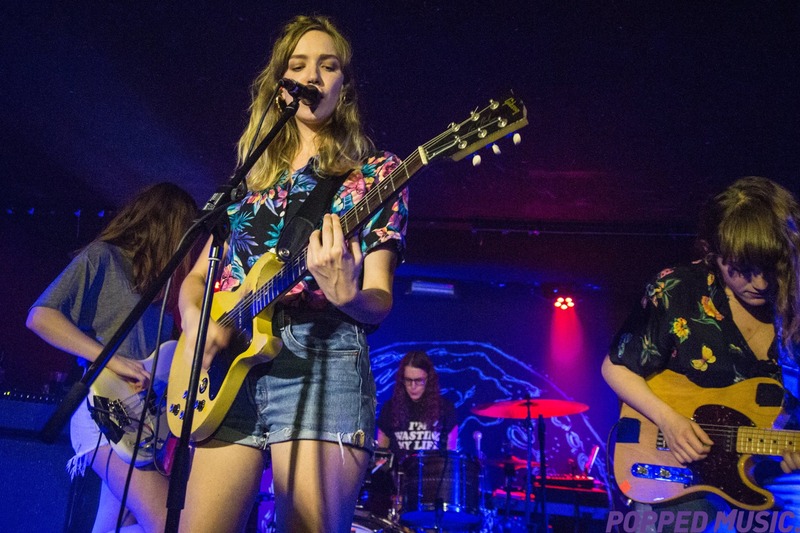 The Big Moon leapt on stage in their customary, colourfully-patterned shirts and denim shorts, bringing back the summer to the dull October evening. Their set blasted off with bouncing, grunge-pop track Silent Movie Susie and its near impossible not to get swept along by their boundless energy. The London quartet reflected on their first performance in Liverpool to only fifteen people at The Magnet. Now here they were showing off tracks from their Mercury Prize nominated debut album Love In The 4th Dimension, released earlier this year, to a packed-out venue. It’s been no small step for The Big Moon. Amongst these tracks was Libertines-esque Happy New Year, The Road and The End. The band seem to have nailed the formula, with catchy, pop hooks that are made for jumping to. We were lulled with dreamy slow-tempo Zeds, which shows off bassist Celia Archer’s melodic backing vocals and Juliette’s innuendo-laced lyrics “I try my hardest to get off… to sleep.” Juliette’s wit extends to her onstage chitchat, with tales of strangers sucking Mini Cheddars to mush (gross!) to learning she had grown an inch taller that week. These girls just want to have fun. So why not a cover of Bonnie Tylers’ Total Eclipse of the Heart? After, of course, the audience had done their vocals warm ups. With hands on chests and heads leant back the audience sang along in heartfelt harmony, “No one on the tour has performed it as good as you just did” Juliette told the crowd, grinning from ear to ear. Crowd pleasers Cupid, with its Pixies-style quiet/loud contrasts and Formidable whipped the crowd intro frenzy and during Bonfire, Juliette joined the madness, moshing alongside her adoring ‘Big Mooners’. 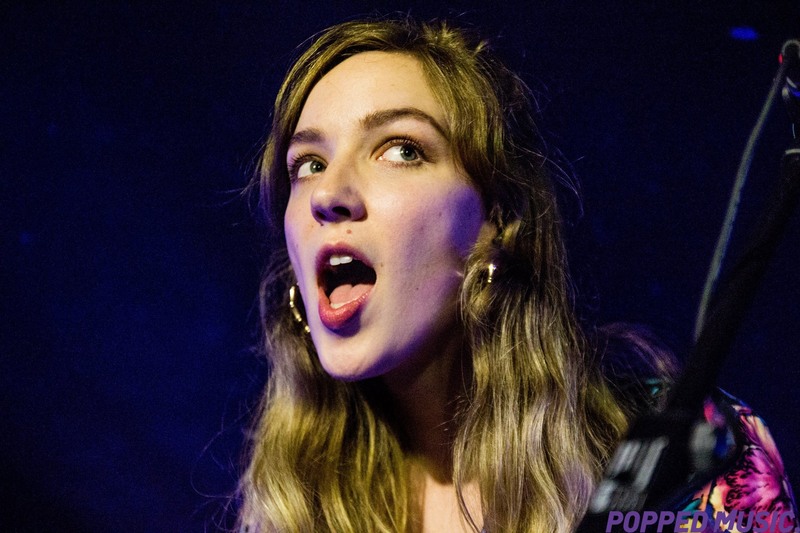 The set came to a climactic close with their debut single Sucker and its closing line “I’m a sucker for you” was echoed in adoration. We’re suckers for you, too.